Frenchmens Landing Home Palm Beach Gardens, FL 33410 has been sold. A WELL MAINTAINED, SPACIOUS FAMILY HOME IN A QUIET GATED COMMUNITY. LARGE FENCED IN BACK YARD BORDERING NATURE PRESERVE ENSURING COMPLETE PRIVACY. HUGE SCREENED IN POOL PATIO AREA, WITH OUTDOOR SHOWER AND EFFICIENT SOLAR PANELS. THIS HOME HAS A 4 YEAR OLD TILED ROOF FOR ADDED PEACE OF MIND.RENOVATED KITCHEN WITH GRANITE COUNTERS AND HIGH END STAINLESS STEEL APPLIANCES. EAT IN KITCHEN WITH LARGE WINE COOLER. CENTRAL VACUUM WITH EXTRA LONG RETRACTABLE HOSE, MAKES CLEANING AN EASY TASK. THIS PROPERTY HAS MANY UPGRADED FEATURES INCLUDING ATTIC FAN, INSTANT HOT WATER AND GENERATOR HOOK UP FOR WHOLE HOUSE. A MUST SEE HOME, PRICED TO SELL. RX-10414738 located in Palm Beach Gardens, FL is a single family home with 3 bedrooms, 2 full baths and 0 half baths.The Home at RX-10414738 was built in 1983 in Frenchmens Landing and offers a 2 car garage. This Frenchmens Landing Home offers tennis, bike - jog, picnic area, sidewalk. 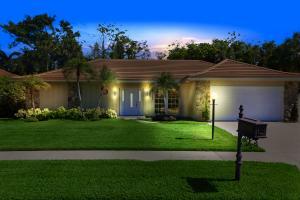 RX-10414738 Palm Beach Gardens, FL is currently listed for $439,900 under the MLS# RX-10414738. This Home has been put on the Palm Beach Gardens MLS system and currently has a status of SLD.